Finally, the semester is over, your final papers are in, your last exams written, and you can close up the books and enjoy life again. When you’re a student in Waterloo, it can be hard to get out of the bubble of student life, but there are plenty of great things to see and do on the Kitchener-side of town. Plan a day to see the other side of the city with friends, solo, or with a date. You’re bound to have a great time if you plan it around an adventurous evening axe throwing, but you can also do lunch at the market and cocktails after. If you’re feeling hungry, make your first stop the Kitchener Market for a cheap but delicious lunch. Go on a Saturday and visit the bustling farmers’ market, but everyday there’s a food court featuring cuisines from around the world. But, this being Kitchener, you can’t miss the Oktoberfest sausages and Belgian waffles at Every Day Gourmet. Walk the calories off by walking around Victoria Park, a beautiful 19th century park, complete with a manmade lake and an island in the centre. Visit the plinth where Kaiser Wilhelm’s bust mysteriously disappeared during WWI or just soak up the sun by the lake. With an axe throwing venue located just off of Park Street, you can now make axe throwing the highlight of the day. 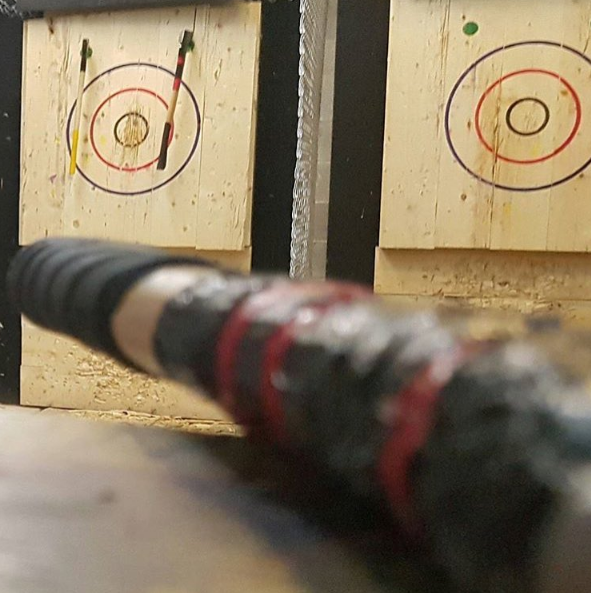 Stop by the Backyard Axe Throwing League, better known as BATL, for one of their walk in sessions after you’ve explored downtown Kitchener. The axe throwing craze began in Toronto a little over a decade ago when league founder Matt Wilson started up league nights in the backyard of a popular chicken wings spot. Since then, axe throwing leagues have opened up across Ontario and the rest of Canada, and inspired no shortage of rivals. Different leagues now send their best to compete against each other in skills competitions and a champions league overseen by the National Axe Throwing Federation. If you’ve never played before, the rules are simple and it’s all about your technique. You’re given an axe and placed in front of a target board, and that’s all you need to know. Actually, expert axe throwers will show you the right technique, teach you the rules of head-to-head competition, and make sure you’re scoring bullseyes in no time. Check out BATL Kitchener for their walk in schedule and drop by with a friend or two, or that special someone. Axe throwing can be a great way to show that Tinder date that you have an adventurous streak – and besides, the dinner-and-drinks routine can get old fast. It’s your chance to test their competitive nature (and see how they act around sharp objects), and all around a great way to get to know each other without the pressure of staring at each other from across the table. If you do hit it off on the axe throwing pitch, BATL is only steps from both downtown Kitchener and uptown Waterloo, so you can always stop by one of KW’s great new bars for a night cap to toast your newfound axe throwing skills. Grand Trunk is always a great choice on Ontario Street, but if you’re Waterloo-bound, Death Valley’s Little Brother on King is known for its single-malt scotch collection and relaxed atmosphere.